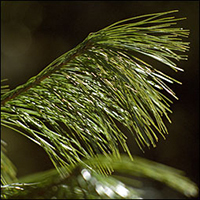 Eastern White Pine, Pinus strobus, has long slender needles that are grouped in bunches of five. It can grow quickly, and reach heights of more than 35 meters (115 feet) at maturity. It is also the provincial tree of Ontario! *Note: trees and shrubs will not be shipped, you will be required to pick them up at a location in Bancroft, ususally on the first weekend in May. Please be sure to provide your contact information so that we can confirm pick-up details.